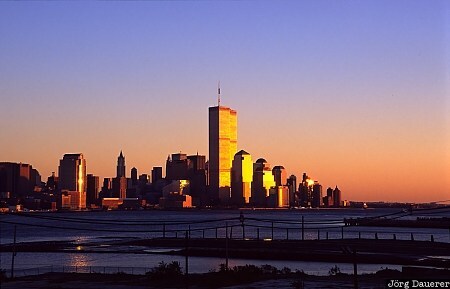 The skyline of downtown Manhattan, dominated by the World Trade Center, illuminated by the setting sun seen from Hoboken. Manhattan is in New York City, New York on the east coast of the United States. This photo was taken in the evening of a sunny day in November of 1996.